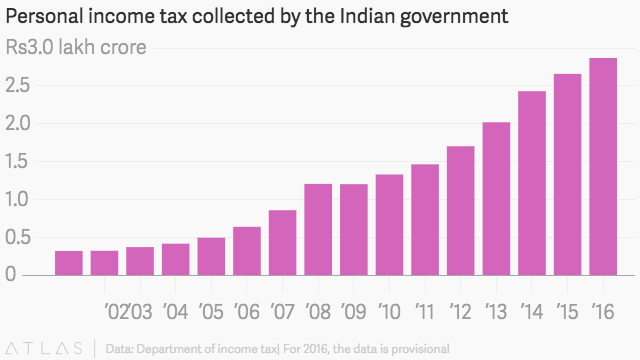 India has published its income tax data for the first time since 2000—and the numbers are shocking. Only about 12.5 million Indians—or 1% of the total population—paid tax on their earnings in fiscal 2013. Although 28.7 million filed tax returns that year, 16.2 million got away without paying any tax, data shows. The total tax paid during fiscal 2013 was Rs1.14 lakh crore ($17 billion), according to the income tax department. Two years later, in 2014-15, this had increased to Rs2.65 lakh crore (pdf). Yet, that is just about 2.4% of India’s GDP. That means the rich aren’t paying enough taxes and the number of salaried Indians is still low. The low tax collection only makes things harder for the Narendra Modi government which has been trying to increase the share of direct taxes in revenue and eliminate black money. Asia’s third largest economy needs this money to spend on its ambitious infrastructure and public service plans. Although the number of billionaires and millionaires is only increasing, that is not necessarily reflected in the coffers. The biggest chunk of tax-payers—about 25%—earns less than Rs5 lakh ($7,500) a year. There were 18,359 under the salaried class earning Rs1 crore ($151,034) and above in 2012-13. Experts, however, aren’t really surprised with the numbers. “The statistics are actually in line with the per capita income of India. It also means most employees in the organised sectors are earning below the limit that is taxable,” said Chitra Jayasimha, practice leader and lead actuary, retirement planning at Aon Hewitt, a consultancy. In 2014, India’s per capita income was $1631, according to the World Bank. They do think the tax net should be widened. 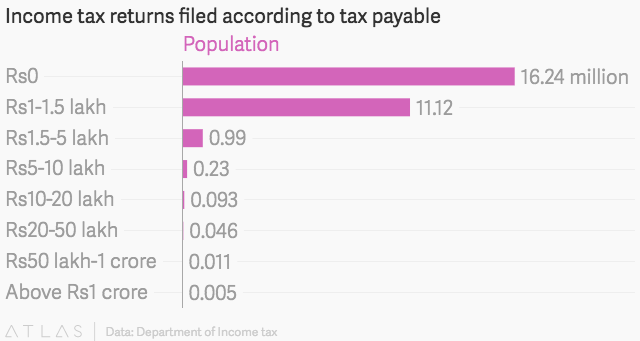 For long, India has had a low tax-paying population. In 2012, the then finance minister P Chidambaram had said that only 2.89% of Indians file income tax returns. More than 50% Indians are engaged in agriculture and allied activities. Agricultural income is exempted from tax in the country. “With such a large population engaged in agriculture and a huge gap between the rich and the poor, the number of taxpayers as a percentage is likely to be low. But these numbers are of concern—are those who needed to pay taxes actually paying, or, are those paying the taxes actually paying the right amount?” explained Kuldip Kumar, leader, personal tax at PwC India. Another reason for low tax collections is that most of the labour is in the country’s unorganised sector. They are paid in cash and are part of the informal economy. The number of Indians in the organised workforce is less than 10% (pdf). Filing returns, but what about taxes? Around 17 million Indians filed their returns in 2012-13, but had no income—and therefore, paid no tax. Over the last 10 years at least, the government has been tracking financial transactions, including credit card payments, bank deposits, and mutual fund purchases, to scrutinise tax payments. Chartered accountants told Quartz that based on these transactions, the government sent notices to such persons irrespective of their employment status. These citizens then filed returns. They, however, did not qualify for tax since there wasn’t any source of income, as many of them were retirees or housewives, for instance, without a steady salary, but with financial assets. These efforts are only for the good, though. The government is using technology to track high-value expenses and transactions and using it to scrutinise tax payments, it will take time for us to see some difference, according to PwC’s Kumar. India’s decision to make its tax records public comes after years of critique from international economists and experts. Thomas Piketty, the French economist, said in January that there is “extreme lack” of data in India, especially income tax. “Our govt. has taken the landmark decision of publishing the income tax data. It is a big step towards transparency & informed policy making,” Modi tweeted on April 29.